The Japanese braille system is based on the original braille script and is known as “tenji” (literally, “dot characters”) in Japanese. As with most other braille languages, it was developed together with the education for the blind during the late 19th century. The specific phonological and orthographic differences in the Japanese language, however, make the transcription process of the Japanese braille a very unique one. Unlike Japanese from the late 19th century, it’s interesting to note that Japanese braille was designed to be read from left to right, and also includes punctuation symbols, such as comma and period. These are the same as the ones used in the European braille codes, but the similarity ends here. Unlike European braille, the Japanese braille system doesn’t have a contracted form. In addition, when writing in Japanese braille, one must separate every word and clause by a blank cell, which improves readability and comprehensibility. As the original Japanese braille system is based only on the kana characters, which in turn prompted the development of the Kantenji Braille in the 1960s – a system that supplements the Japanese braille by providing a means of directly encoding kanji characters. It uses an 8-dot braille cell, with the lower six dots corresponding to the cells of standard Japanese Braille, and the upper two dots indicating the constituent parts of the kanji. Ever since it was developed in 1886, the Japanese Braille system has been widely used and taught in schools for people with special needs. 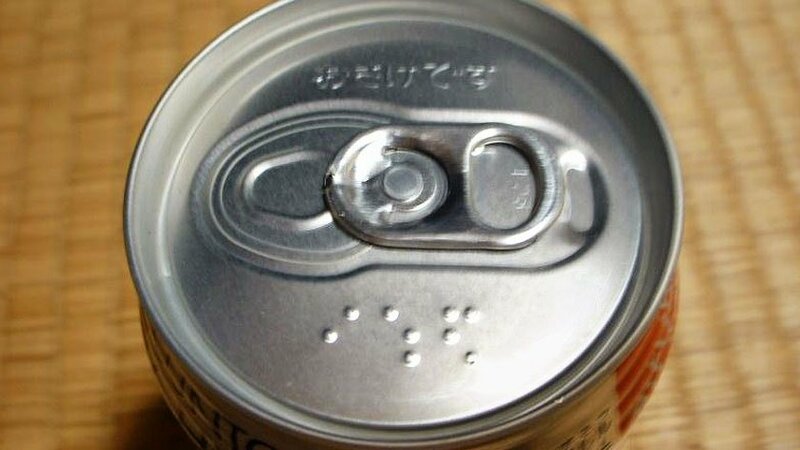 It has been heavily implemented in daily life, going as far selling alcohol cans with “alcohol” written in Braille, to prevent someone from accidentally buying beer (or the other way around! ).